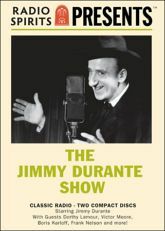 Jimmy Durante demonstrates his unique charm. Experience his gregarious, larger-than-life personality, infectious good cheer, and malapropisms as he is joined by special guest stars Dorothy Lamour, Victor Moore, Boris Karloff and Frank Nelson in these classic radio shows. Also joining in on the fun are cast regulars and supporting actors Arthur Treacher, Elvia Allman, Candy Candido, Dave Barry, Alan Reed, Peggy Lee and many more.